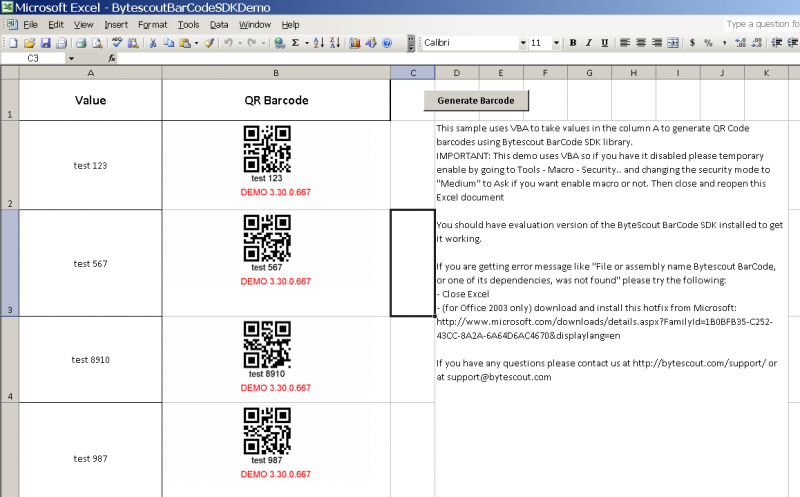 This sample uses VBA to take values in the column A to generate QR Code barcodes using Bytescout BarCode SDK library. Important: This demo uses VBA so if you have it disabled please temporary enable by going to Tools – Macro – Security.. and changing the security mode to “Medium” to Ask if you want enable macro or not. Then close and reopen this Excel document. You should have evaluation version of the ByteScout BarCode SDK installed to get it working. ‘3) Parse the value to Bytescout Barcode Object to generate the barcode using QR Code barcode type. ‘Insert the Barcode image to the Column B and resize them to fit the cell. ‘ Release the Barcode Object.